Hi everybody! I’m sorry I haven’t been around much lately but I’m not very well and I haven’t felt like doing much of anything except handsewing. That being said this state of affairs has enabled me to finish the Humanity quilt top. I almost changed the layout a few times but I ended up with this, which is almost, but not quite, the same as I had on the design wall. Great balance, which is SOOOOO important. More importantly though, I hope you feel better soon. I’ve missed you! I was hoping you were just busy. I’m sorry you’re not feeling well. I hope it’s something that will be gone soon. The Humanity quilt is lovely, and I’m glad you felt up to the handstitching! I’ll continue to keep you in my thoughts, and hope you are feeling back to your regular self soon. Looks really good! I can’t believe how fast you stitch. I do hope you are feeling better! Sorry to hear you are unwell. I hope you are on the mend! Looks great, Munaiba! I hope you feel better realy soon! 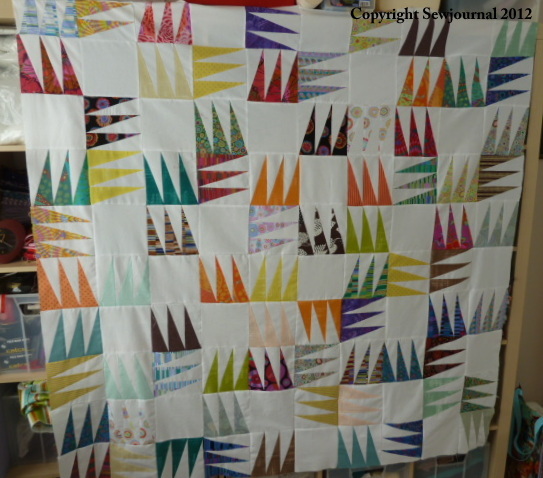 You are currently reading The Humanity Quilt Top is finished at Sewjournal.